Today I bring you a guest post by author Kristin Bair O'Keeffe. She shares with us about the joy of reading with her daughter. 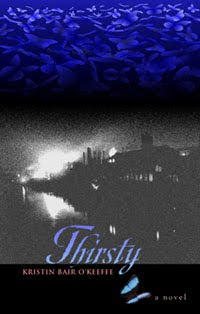 Be sure to check out her new novel Thirsty. I've only read part of it so far, but the story really draws you in. I look forward to finishing it. Thanks for sharing with my readers, Kristin! You are welcome back anytime! 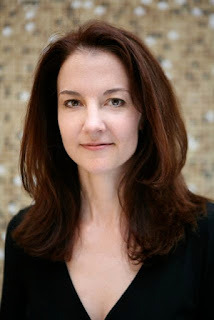 Kristin Bair O’Keeffe is the author of Thirsty and an American who lives in Shanghai, China. She is also a happy mom, a voracious reader, an engaging teacher who believes in “telling the best story you can…believing in your writing…and working your arse off,” a fierce advocate for the end of domestic violence, and a writer who spends as much time as possible in writerhead. To find out more, visit www.thirstythenovel.com or Kristin’s blog at www.kristinbairokeeffeblog.com. At twenty-two months old, patience is not Tully’s strong suit, but really, if she’s hollering about wanting to read, who am I to complain? “Okay,” I said. “All set.” And I placed a plate of ham, cheese, and green beans on her tray. “What should we read first today?” I held up our three current favorites: The Very Hungry Caterpillar by Eric Carle, The Family Book by Todd Parr, and Where the Wild Things Are by Maurice Sendak. “Max! Max!” she yelled, stuffing two green beans into her mouth at the same time. “Max it is,” I said and set The Family Book and The Very Hungry Caterpillar on the table within easy reach. “Sendak!” she hollered (which admittedly sounded a little more like Ssndk). Finally—between bites—Tully requested our nursery rhyme book. “Twinkle, Twinkle,” she said, closing and opening her hands like twinkling stars. We usually wrap up lunch this way, singing our favorites like “Twinkle, Twinkle Little Star,” “Little Boy Blue,” and “The Itsy Bitsy Spider.” By the time we’d sung/read four or five rhymes (including the very wacky “Goosey, Goosey Gander”…just what the heck is that old man doing in the lady’s chamber? ), Tully had cleaned her plate. Lunch was over. “Down!” she hollered, suddenly frantic to be free. And as I wiped her hands and mouth, I thought about what we’re both getting out of our lunchtime read-a-thons. I get a chance to practice patience and mindfulness….being in the moment. I get to read out loud in kooky voices. I get to share one of my greatest loves—reading—with my daughter. Well, I know she’s learning lots more than just the text of the stories we’re reading. She’s learning about sequence (beginnings, middles, and endings), authors and illustrators, relationships between pictures and text, letters, counting, and sounds. She’s also learning about emotions—Max’s loneliness, sadness when you lose someone you love, how it feels after you’ve eaten way too much. Most importantly, she is learning to love books. Like her mama. Loved Kristin's post. I love reading time too. With a wild six year old boy(not unlike Max)I get a chance to just sit!!!! for a few minutes. Reading time also works as a bribe for me. "Finish your homework/bath/supper first, then we can read." Cuts out all the arguing and procrastinating. And I, in turn, love the promise of being able to use reading as a bribe someday. "Finish your homework/bath/supper first, then we can read." Brilliant. Thanks for having me here at "Ramblings of a Texas Housewife"!